← The Anatomy of a Rivalry, The First Stanza….. The Anatomy of a Rivalry, The Second Stanza, The Transaction…..
Are the Sox spoilers for 2012? On January 6, 1920, newspapers throughout the country told the news which had been rumored for weeks. 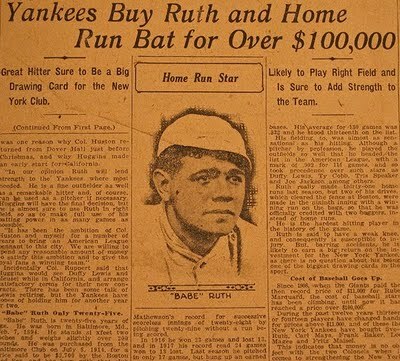 The Boston Red Sox sold Babe Ruth to the New York Yankees! When looking back at this event through the eyes of nearly a century of hindsight, it is easy to scoff and decry such a move. Although there will always remain an element of disparity in evaluating this transaction; it is important to note and understand that events do not unfold in a vacuum. 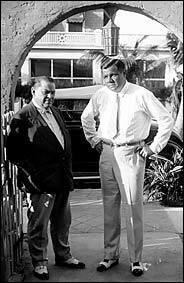 Harry Frazee and Babe Ruth. So then how is it that Red Sox owner Harry Frazee came to conclusion that it was a good idea to rid himself of Babe Ruth, the greatest baseball player who ever lived? This entry was posted in Fenway Park Baseball and tagged Red Sox/Yankee Rivalry. Bookmark the permalink.